Unless you take a peek under the hood, there’s no way you can tell that this coupe is based on an E92-generation M3. Bilenkin redesigned every single body panel and made use of features that were common on 1950s and 1960s cars. Up front, there are two pairs of round headlamps and an old-school grille with horizontal trim on each side of the emblem. The standard bumper was replaced by a classic two-piece chrome model with integrated turn signals. Both the headlamps and the grille have chrome frames, which add to the car’s retro authenticity. 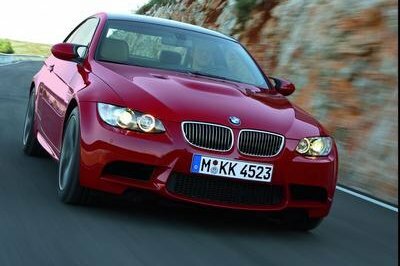 The engine hood and the fenders were also reshaped into more complex designs compared to the M3’s. The engine hood and the fenders were also reshaped into more complex designs compared to the M3's. Onto the sides, the roofline and the windows (including the Hofmeister kink) are the only features that still resemble the E92 M3. The rest of the lines, however, are not only new, but quite dramatic — even when compared to the gorgeous automobiles of the 1960s. The waistline is highlighted by a chrome strip that stretches from the headlamps all the way to the rear fenders. Arguably the most spectacular features are the unique fins that raise above the wheels and step down toward the taillights. The chrome trim on the sides is also used to highlight the coupe’s two-tone paint scheme. On this particular example, the upper section is finished in green, while the lower portion is painted gold. The classic wheels are also finished in gold, feature chrome hubcaps and are wrapped in narrow whitewall tires. Around back, the Vintage has a trunk lid design that reminds me of the Aston Martin DB5, vertical taillights with chrome frames, a one-piece chrome bumper, and dual exhaust pipes. 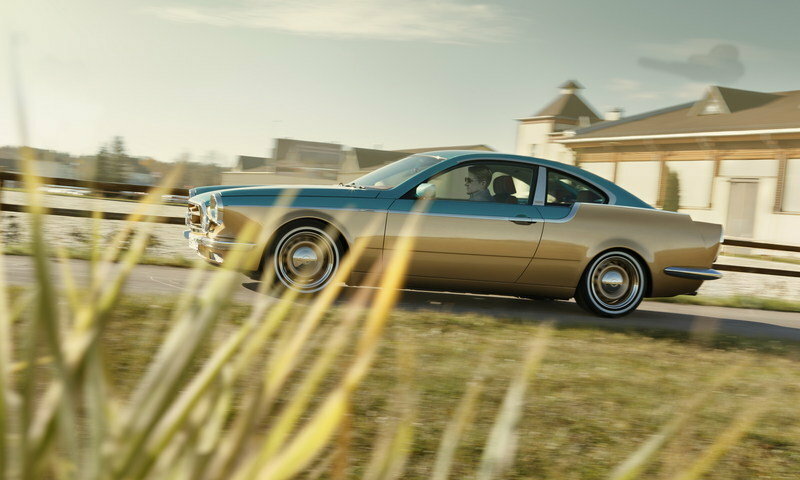 Like the rest of the car, the rear fascia sports the same two-tone finish with a green center section and gold fenders. every detail has been redesigned from a clean sheet. On the inside, the Vintage blends retro styling cues with modern technology and more luxury than the BMW M3 ever offered. Again, every detail has been redesigned from a clean sheet. Although simple by design, the dashboard looks stunning thanks to the big chunk of wood that covers everything but the instrument cluster and the brown leather top. 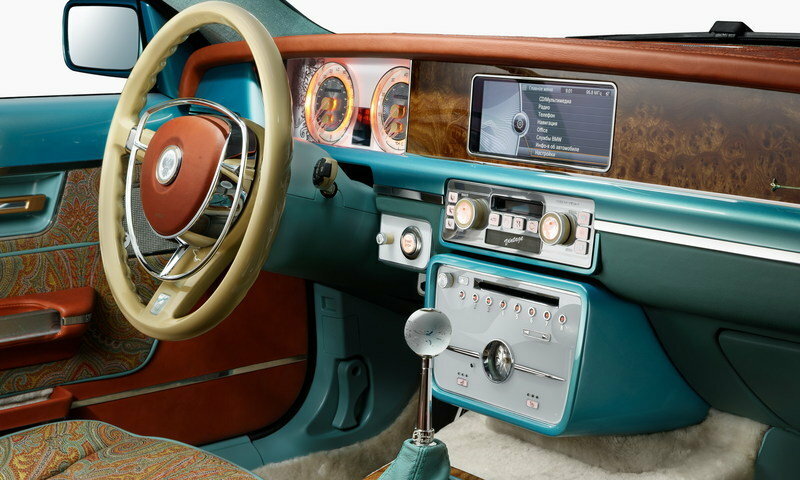 The lower dashboard area is finished in two shades of green that resemble the exterior paint, while the retro, three-spoke steering wheel has a gold rim and chrome elements around the center section. Bilenkin used paisley fabric to upholster the car’s seats and wheels, which give the cabin a more exotic appearance. But, even though it looks unique, this configuration might not be to everyone’s taste. Hopefully, the Russians have classier upholstery designs on offer. Additional high-end touches include a crystal shift knob, shag carpeting, and even gold inserts and diamonds. Based on these options and the upholstery, it’s no surprise that the Vintage was launched at the Dubai Motor Show. While the Vintage’s exterior and interior are no longer recognizable as a BMW M3, its drivetrain carries over unchanged. This should be excellent news for BMW enthusiasts, as the E92 M3 had the extremely capable and desirable 4.0-liter, S65 V-8 engine. The unit cranks out 414 horsepower at 8,300 rpm and 295 pound-feet of torque from 3,900 rpm. Since Bilenkin has yet to release performance information and we don’t know anything about the Vintage’s curb weight, the 0-to-62 mph sprint is difficult to estimate, but the standard M3 Coupe needed 4.6 seconds to hit the benchmark. Top speed is likely to remain unchanged at 155 mph. 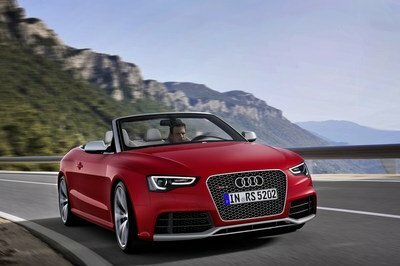 The engine mates to either a six-speed manual transmission or a seven-speed automatic gearbox, depending on the drivetrain configuration of the donor vehicle. Bilenkin is asking €130,000 (around $196,350 as of December 2015) for the conversion, which likely doesn’t include the price of the donor BMW. Granted, that’s not exactly affordable, but still somewhat of a bargain given the unique appearance of the car and the premium interior. However, you should be prepared for a sticker that goes beyond the €160K mark with the gold- and diamond-crafted options. Meet the Puritalia 427; the latest niche sports car that will try to beat the odds and make it to production. Read all about it at TopSpeed.com. Although finding a specific competitor for the Bilenkin Vintage would require a lot of digging, the market has plenty of neo-retro cars to offer nowadays. 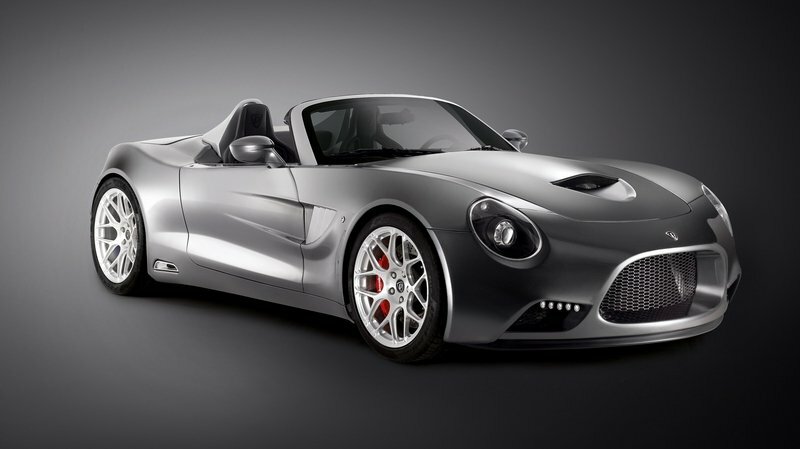 One example is the Puritalia 427, a modern rendition of the iconic Shelby Cobra. 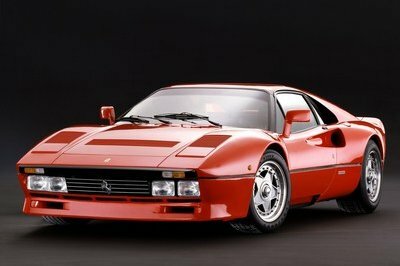 While the styling is more neo than retro, the Puritalia does come with a no-nonsense interior and an American V-8 engine. The 5.0-liter unit is sourced from the Ford Mustang GT and is available in two flavors. There’s a naturally aspirated version with 445 horsepower and 390 pound-feet of torque and a supercharged variant that cranks out 605 horses and 472 pound-feet of twist. 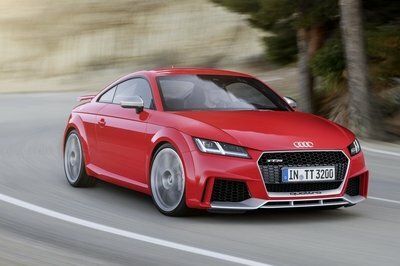 Pricing starts from €180,000 (about $195,700) before taxes in Europe and production is limited to 427 examples. Find out more about the Puritalia 427 here. The Jaguar XKR-based Dave Brown Automotive Speedback GT is modern British awesomeness wrapped up in a neo-retro package. If you need something with a roof, than you can take it to David Brown for his latest Speedback GT. 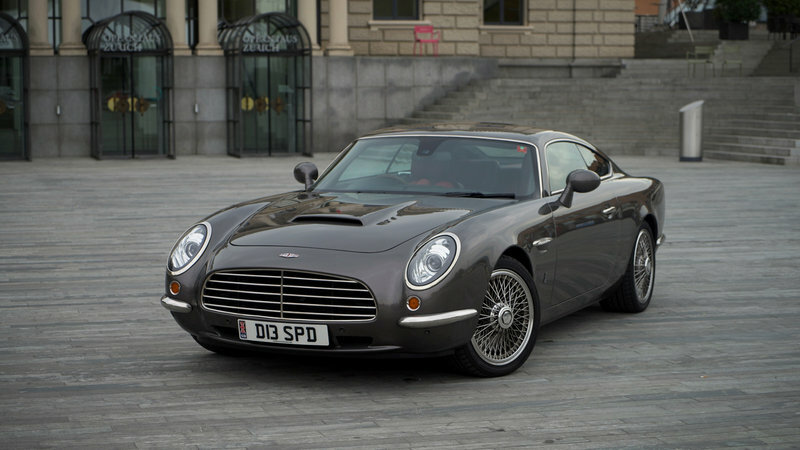 Built on Jaguar XKR underpinnings but rebodied to look like an Aston Martin DB5, this British coupe features a premium interior and a supercharged, 5.0-liter V-8 rated at 503 horsepower and 461 pound-feet of torque. 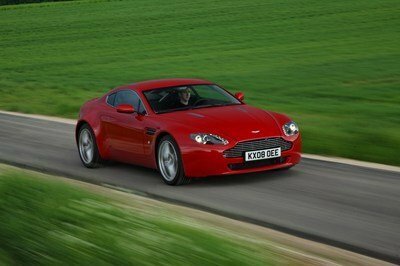 It also comes with a six-speed automatic for improved comfort and it’ll take you from 0 to 60 mph in just 4.6 seconds. The Speedback GT does have a big drawback, however, being sold with a £495,000 (around $747,670) sticker. Read more about the David Brown Automotive Speedback GT here. From a design standpoint, the Bilenkin Vintage is stunning to look at. If you love 1950s and 1960s European cars, that is! 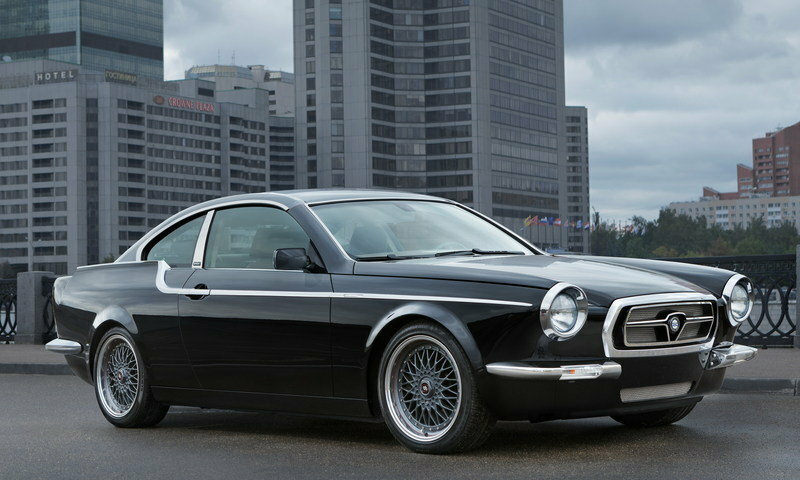 Many neo-retro designs fail to capture that specific vintage feel, but Bilenkin managed to do just that with this coupe, while also adding a little twist to the styling by using extra chrome and a two-tone paint scheme. The fact that it sports a BMW-made S65 V-8 engine under its hood and rides on a sporty chassis makes things that much better. On the other hand, the interior is not the kind I would like to spend too much time in, mostly because of the kitschy upholstery and the hideous white inserts in the door panels. But, with the right interior, the Vintage would make an awesome show car.